The term postcard quilt can actually apply to several quilt types. You may want to try you hand at a quilt top pieced with 4 by 6 inch rectangles. Another possibility is to create a unique mini quilt that is actually sent as a greeting. 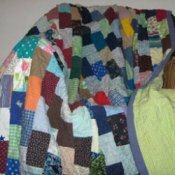 Some quilters make varying sized applique quilts commemorating their travels. Create your own postcard. This is a guide about making a postcard quilt. This quilt, called "Postcards" was done entirely by machine. For the backing I used a seersucker fabric to add to the puffy feel of the quilt. Very pretty. I'll bet it is warm and cozy. Nice job. What a nice idea for a quilt. Thanks for sharing.